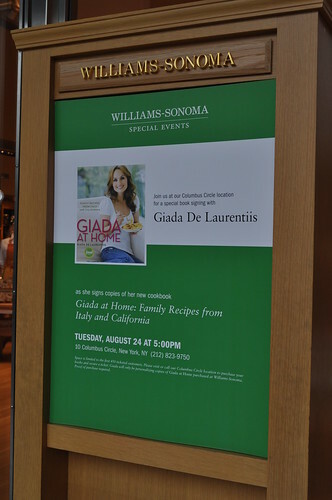 Yesterday, I went to a book signing for Giada De Laurentiis and her new book, Giada at Home: Family Recipes from Italy and California, at Williams-Sonoma (same location as the Thomas Keller signing--Columbus Circle) with Linda and my really good friend from college (and co-worker! ), Eleanor. Coincidentally, Linda and I also made dinner plans at Danny Meyer's Maialino (that post to follow this one) for yesterday night. Please note that Linda and I haven't seen each other or hanged out since the Thomas Keller signing last November! That was nine months ago! She made a joke to me later in the night that we only see each other during nights of book signings. I laughed and immediately retorted that we'll be breaking the "tradition" next week when we attend Outstanding in the Field together at La Plaza Cultural in the Lower East Side/Alphabet City (can't wait to post about that)! Eleanor (if you've read this post earlier, I had to keep her name a secret because she was surprising her boyfriend for his birthday with a signed book, and since she finally gave it to him over Labor Day weekend, I can say Eleanor now! Yay!) and I arrived at Williams-Sonoma (lesson learned from the T. Keller signing) at 3:30pm, as the signing was to start at 5pm. She arrived there a little before I did to pick up her SEVEN copies of Giada's new book. Someone's doing holiday shopping very early this year :] very smart! The event stated that space would be limited to the first 450 ticketed customers, so we had to call ahead and order our books so we could pick them up the day of the signing as well as to guarantee a spot in line. Eleanor told me one of the sales associates told her she was crazy for coming this early. I told her that the sales associate was crazy herself for saying that because once it starts approaching closer to 5 o'clock, the line length is going to be unpredictable, and you'll never get out! She even mentioned that she heard when Martha Stewart was signing books at this very same location, it took some individuals THREE HOURS to receive their signed copy! The madness! A shot of what the line looked like from where we were (Linda showed up later). Not too shabby (even if I did get yelled at for taking this photo inside the store--whatever)! 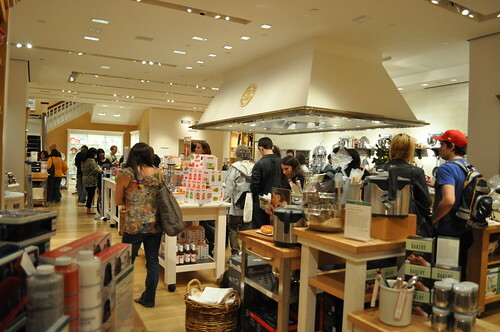 Williams-Sonoma is also known to give out samples they cooked in the store of a couple recipes from the cookbook being signed that day. Unfortunately, I couldn't get photos of the two things they prepared. The first was the pea pesto crostini (page 25). It's infused with Parmesan, so I only had a bite (Parmesan and I cannot be friends, unfortunately--it upsets my stomach too much). Eleanor said it was really good, so I trust that it's great for you Parmesan lovers out there! The second sample they passed around was the pasta ponza, which is a ziti dish with tomatoes, capers, sprinkled bread crumbs, and some cheese. It was a bit cold, but I guess if you're preparing for 450 or so people waiting in line, food won't stay hot for too long. Once it hit 5pm, the line started moving very rapidly, and we got to Giada by 5:20-5:30, so that worked out well! 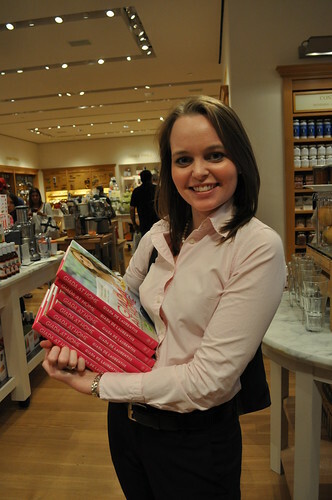 The store wouldn't let us take photos with her (as I got to with Thomas Keller), but we were allowed to take photos of her from a "designated" spot (i.e., where I stood when I took this photograph of Eleanor, waiting for Giada to sign her books!). Giada is just as friendly and down-to-earth as she seems on her show! Look at her talking to this little girl! 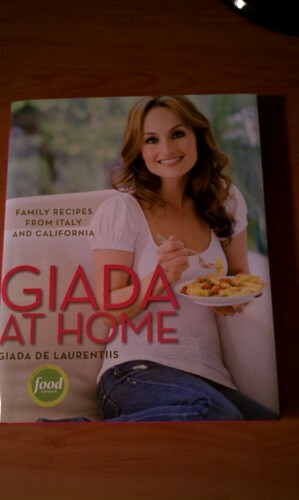 My copy of Giada at Home. The signed and personalized title page! Findings: I think it's always nice to meet the chefs/writers behind a cookbook/novel/memoir/etc.--I'm a little obsessed with going to book signings. Can't wait to start perusing and trying out these recipes--family-style usually implies that they're not too difficult to conjure up. 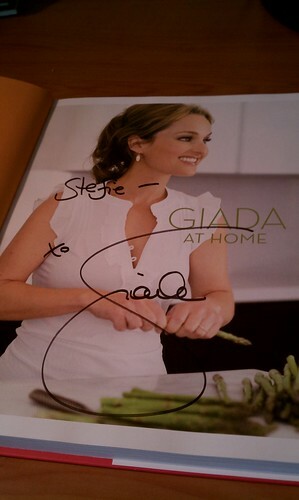 Look forward to future posts with Giada recipes! Thanks to Linda and Eleanor, I now can add "meeting Giada" and "having a signed book by Giada" to my Beeline and John Hancocks collection on Flickr. Price point: $35 for each book.